This work presents the results of spectroscopic (MIR and Raman) studies of zeolite structures after immobilization of heavy metal cations from aqueous solutions. The sorption of Ag+, Cu2+, Cd2+, Pb2+, Zn2+, and Cr3+ ions has been conducted on zeolites belonging to different structural groups, i.e., sodium forms of natural chabazite, mordenite, ferrierite, and clinoptilolite, as well as on synthetic zeolite Y. Systematic changes in intensities and positions of the bands corresponding to the characteristic ring vibrations have been observed in the measured spectra. The most visible changes are observed in the FT-IR spectra of the samples in the range of 850–450 cm–1, and in the Raman spectra in the range of 600–250 cm–1. Depending on the zeolite structure, the bands, which can be regarded as a kind of indicator of ion exchange, were indentifi ed. For example, in the case of IR spectra, these bands are at 766, 703, 648, 578, and 506 cm–1 for zeolite Y, at 733 and 560 cm–1 for mordenite, at 675 cm–1 for clinoptilolite, etc. The degree of changes depends on both the type of cation and its concentration in the initial solution. This is connected with the way of binding of metal ions to the zeolite aluminosilicate framework, i.e., a proportion of the ion exchange and chemisorption in the process. Cations mainly undergoing ion exchange, such as Cd2+ or Pb2+, have the greatest impact on the character of the spectra. On the other hand, Cr3+ ions practically do not modify the spectra of zeolites. 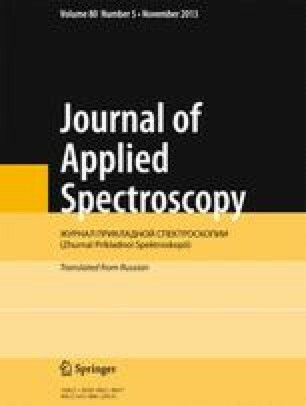 Results of IR and Raman spectroscopic studies have been compared with those obtained by atomic absorption spectroscopy (AAS), from which the proportion of ion exchange to chemisorption in the process and the effective cation exchange capacity of the individual samples have been estimated. Published in Zhurnal Prikladnoi Spektroskopii, Vol. 80, No. 5, pp. 662–668, September–October, 2013.